On Dec. 2, 2017, the sanctuary of the Hebrew Educational Alliance was filled to overflow capacity for Koby Gruenwald’s Bar Mitzvah. Fifty days later, Jan. 21, 2018, the sanctuary filled once again, this time for Koby’s funeral. Yaakov “Koby” Rani Gruenwald lost his 22-month battle with brain cancer a half hour before Shabbat began on Friday, Jan. 19.
celebration of Koby’s life was entwined with unimaginable grief, the depth of which is reserved for the loss of a child. Cantor Martin Goldstein of the HEA opened the service singing the Beatles’ “Let It Be,” one of Koby’s favorite songs that he loved to sing at Shabbat and holiday services. The mourners in the congregation sang the chorus of the song along with the cantor. The cantor chanted Psalm 23 in Hebrew, and Rabbi Bruce Dollin, who officiated at the funeral, read the Psalm in English. Rabbi Dollin called Koby “a very sweet child — fun, full of life — who would make his friends laugh.” Koby loved children and babies, and even after his illness he would go up to people and tell them how cute their babies were. Koby was born Nov. 21, 2004, in Los Angeles. 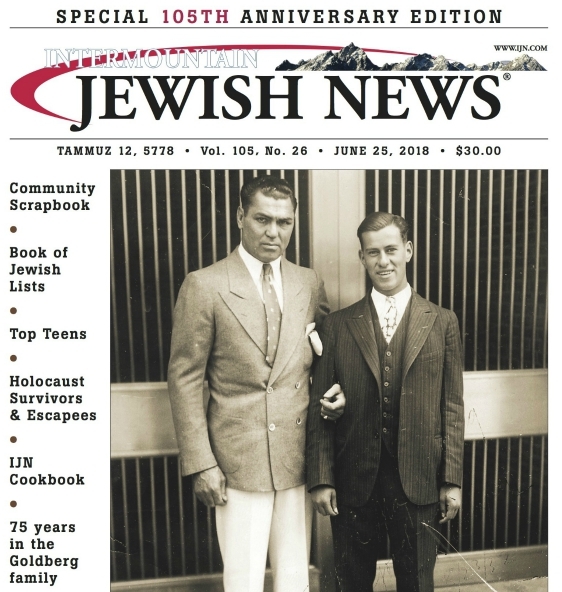 He was three-and-a-half when he came to Denver with his family as his father took the position of assistant rabbi at HEA. He is now associate rabbi. Rabbi Dollin said Koby learned to snowboard — and loved it. He also loved baseball, and he loved Denver Jewish Day School, where he was popular. He could also be a little mischievous, the rabbi noted. He remembers him going on the bimah, scrounging for candy that had been tossed for a Bar or Bat Mitzvah or aufruf. Koby loved music, even in the later days of his illness. The musical Shir Chadash service at HEA became Koby’s spiritual home. In those services, “he drummed his heart out,” Rabbi Dollin recalled. Even after he got sick and lost the use of one of his hands, he drummed one-handed. When he was sick, his love of music manifested itself in his own show at the Seacrest Studio at Children’s Hospital, where he hosted the Koby Karaoke Hour, to the delight of other young patients at the hospital. He also had the opportunity to perform at Red Rocks during the week after his Bar Mitzvah. Through tears and between sobs, Koby’s Uncle Daniel Gruenwald, Aunt Judy Mass, Uncle and Aunt Allison Sasson and grandmothers Sonia Gruenwald and Shelia Sasson, recalled memories of Koby and expressed their love for him, his parents and siblings. Besides “Let It Be,” Koby’s other favorite song was Leonard Cohen’s “Hallelujah.” No Shir Chadash service at HEA was complete without Koby belting out the biblically-inspired ballad. Rabbi Joe Black of Temple Emanuel — who frequently visited Koby and sang with him during his illness — and family friend Kolby Morris Dahary sang “Hallelujah” while the mourners in the congregation wrapped arms around each other and swayed and sang along. The service concluded with Cantor Goldstein’s chanting of the E-l Male Rachamim memorial prayer. Burial took place at Mt. Nebo Cemetery. Feldman Mortuary made the arrangements. Koby is survived by his parents Rabbi Salomon and Melanie Gruenwald, sister Hannah Gruenwald and brother Micah Gruenwald, and grandparents Willie and Sonia Gruenwald, Sheila Sasson, and Howard Sasson. He is mourned by many aunts, uncles, cousins and friends. The family suggests memorial contributions to Morgan Adams Foundation, Children’s Hospital of Colorado Center for Cancer and Blood Disorders, Roundup River Ranch Camp, Camp Ramah in the Rockies, The Denver Hospice, DJDS or HEA.